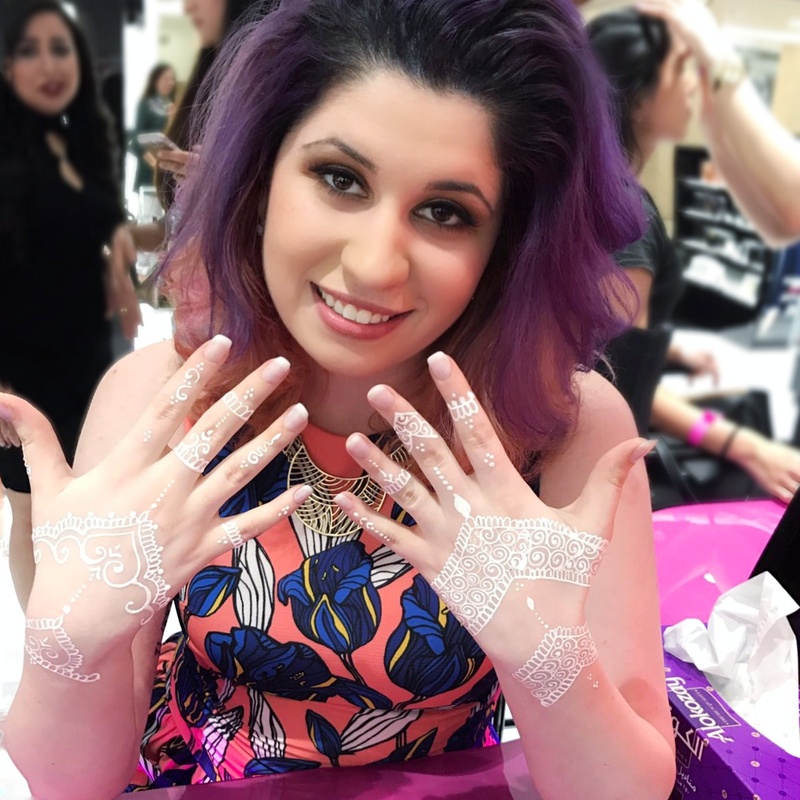 When I went to Layal’s launch party, Girly Henna was there doing her famous white henna on everyone that was at the store. She was super busy and doing henna there for hours. I feel sad that we didn’t have the proper conditions to meet, but that didn’t change a single bit of what a sweet girl she is. I felt that the moment it was my turn to do the henna, it was my special moment. She heard what I wanted and didn’t disappoint me on the design. I am a very picky person and very perfectionist… So I feel very bothered when the henna artist doesn’t really care about what I want or take her time to listen to me and to do a good work. We spoke about her work, talked a little about ourselves and I just couldn’t hep it: I had to say what a great fan I am of her work. She is so sweet that she felt all shy and blushed. She hears compliments and appreciations all the time, she is the “super star of henna artists” but she still maintain herself as a down to earth and humble girl. That made me fall in love even more. Now, about the white henna. It was my first time doing it. I never researched about it and I only knew it through pictures. I never even wondered which material that was made of… hahahahaha. I just wanted to get it done, as I always saw it in pictures and on Huda Beauty’s hands and I always thought it is super pretty. As soon as it started drying, by mistake, I touched the edge and it felt so sticky!! That bugged me a little, but I decided to let it fully dry. Once home and hours after getting it done, the look of it was very shinny, which made me doubt that it was really dry. I touched it and it was dry!! I touched harder and I felt the sticky feeling again, like if it was dried glue on my hand (yes, i used to play with glue on my hands when I was a kid just to peel it off later… hahahahaha). So there I go to investigate on Google. I can’t say how Girly Henna’s product is done, but what I found on the internet is that the white, gold and glittery henna is done by mixing white body paint (or any other color) and body adhesive. That’s why it feels so sticky! It lasts one to 7 days, depending on how often you have contact with water. I also read that you can set up the henna with corn starch once it is dried. It can help your henna to be less sticky and last longer. Unfortunately, my henna only lasted 24 hours… My heart broke when it started peeling off. But the good think about it is that it doesn’t stain the skin! So you can keep doing as many designs as you want in a shorter period of time. Or if you want to do the henna, but have other events to go and the henna is not appropriate, this is life savior!! I totally recommend Girly Henna if you are going to throw a house party or wedding functions. You can set up a time with her on her whatsapp. And also check more of her work here. Previous Previous post: Layal Burjuman launch party! !